A new solar energy project is taking root in Japan and it may be the largest of its kind in the country. 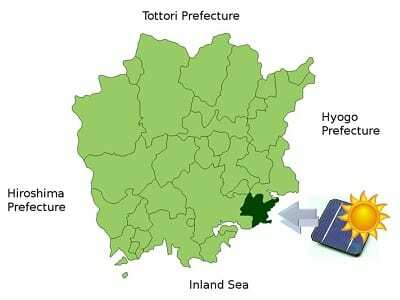 General Electric is the entity behind the project and the company will be building an expansive solar power facility in Setouchi, a city located in the Okayama Prefecture. Eurus will be the company responsible for manufacturing the technologies being used for the project and General Electric will take responsibility of its operation after the project is completed at some point in 2018. The solar power plant is expected to have a capacity of 230,000 kilowatts, making it among the largest solar power facilities in the world. The project will provide power for approximately 80,000 homes in the Okayama Prefecture and represents General Electric’s first entry into the Japanese solar market. While the project’s primary goal is to produce electrical power, it will also serve as a showcase of General Electric’s energy transmission equipment and the technology developed by Eurus. The project itself is estimated to cost approximately $777 million to develop. General Electric will cover as much as 25% of the project’s total cost. The project is receiving some financial support from the Japanese government and private investment groups. The Japanese government has begun showing a great deal of support to solar power as the country begins to distance itself from nuclear energy and fossil-fuels. Solar power has been highlighted by the Japanese government as a powerful economic tool that could help create jobs throughout the country and generate strong economic activity. General Electric currently operates eight solar power facilities in the U.S. and Europe, accounting for some 900,000 kilowatts of combined capacity. The company has been working to expand its presence in the solar market aggressively over the past few years. Japan represents one of the most active and attractive solar power markets in the world because of the country’s aggressive feed-in tariff and other government policies that support the development of solar energy projects.